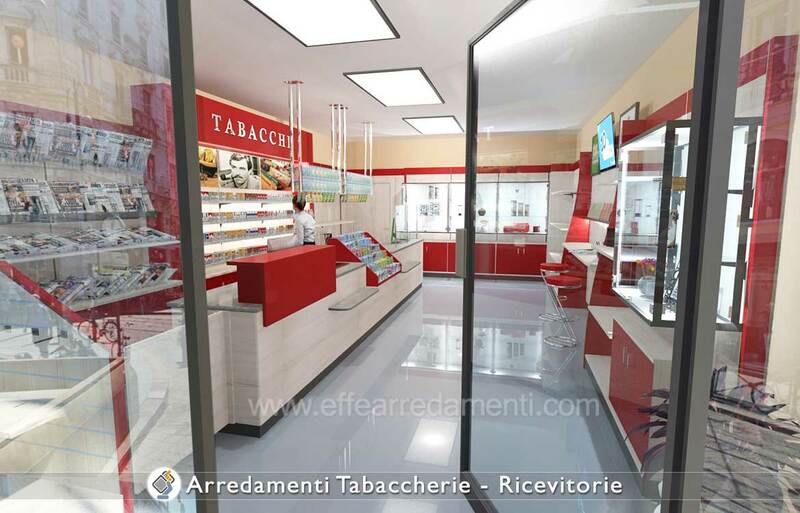 Effe Arredamenti is Design, Production and Set up of furnishings for tobacconists and bar receivers with a high level of customization. Our furnishings enjoy a high level of customization: this means that you can organize them according to your wishes thanks to the modularity and modularity of the same. 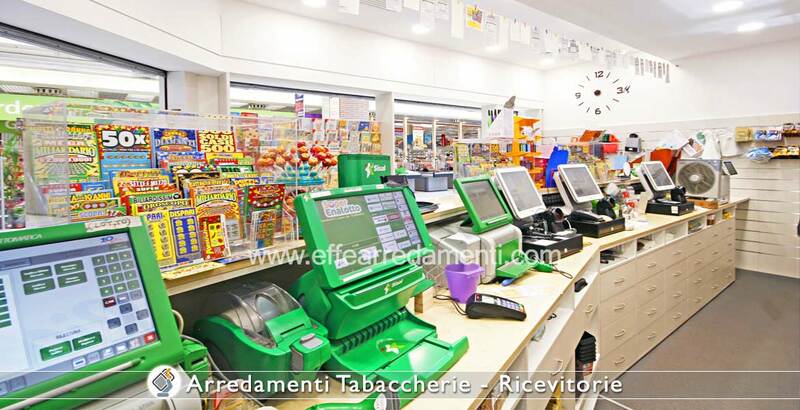 Cigarettes, smokers, liquids for electronic cigarettes, Scratch and Win, Sisal and Lottomatica find the most effective exposure and organization for sale, thanks to the Effe Arredamenti furnishing systems, which he conceived, conceived and developed to leave nothing to chance and offer you all the potential to create with us a new, modern, functional and attractive tobacconist. 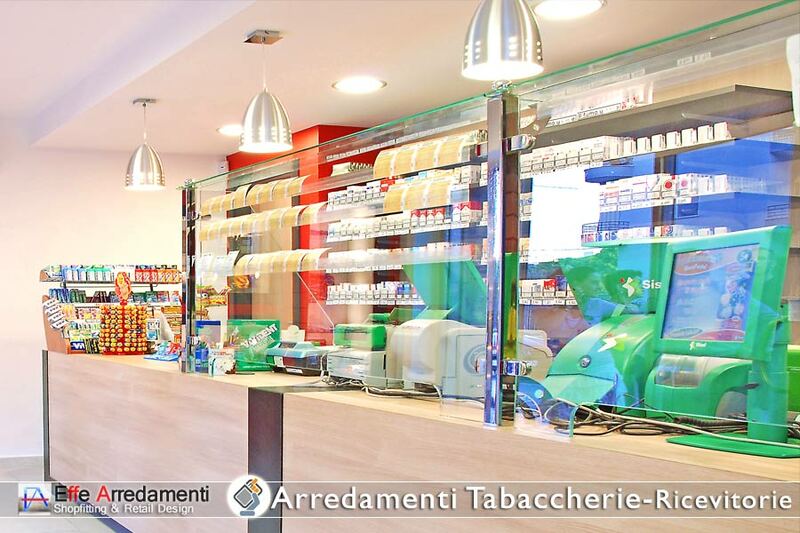 Glass tops, display counters with display cases, illuminated display windows perimeter walls (store walls), drawer units, storage cupboards, back-lit equipped walls, card holder, push automatic packages, Bar counter, this and much more is the essential that Effe Arredamenti offers you for your retail outlet of Tobacconists and Retailers. 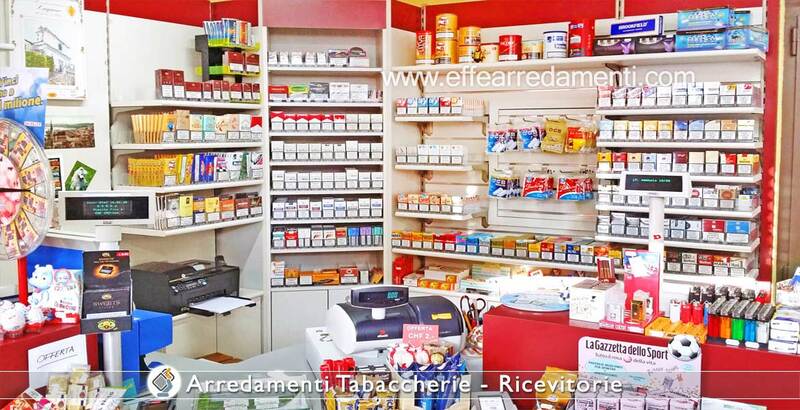 If you have to furnish or renovate the furnishings of a tobacconist's shop or bar do not wait, contact us! 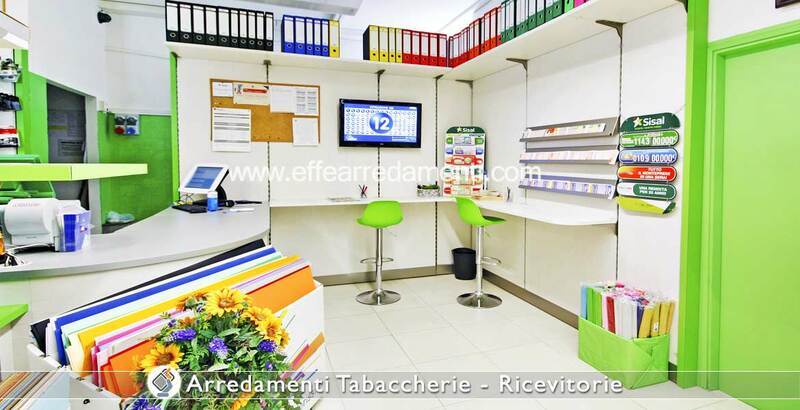 Photo n. 003 - In photography, Effe Arredamenti has created this complete furniture for tobacconist, receivers and scratch cards. In the foreground the cash desk and the reception counter with tops (top) in marble, inside the counter, on the shop side, assortment of floors, drawers, open compartments, computer compartments and removable shelves. Second floor retro counter made up of modular wall equipped with glass tops and exhibitors for traditional cigarettes but also exhibitors for iqos and glo, base coffered, ceilings (upper parts of the store) with backlit prints. Photo n. 004 - Complete tobacconist of furniture for receptions, exhibitors for tobaccos, counters, illuminated display cases for display of gift items, display furniture for window display. Photo n. 005 - In this beautiful photograph, you can see how Effe Arredamenti realized theamoblamiento and the allestimento for tabaccheria ricevitoria edicola and angle Bar. At the central cash desk surround the walls equipped to contain the items you intend to display and sell. Below, on the right, drawers for stocks. To be noted at the top the scratch card exhibitor hanging from the ceiling. Photo n. 006 - At a shopping mall in Bologna, Effe Arredamenti made the furniture for this tabaccheria and ricevitoria. 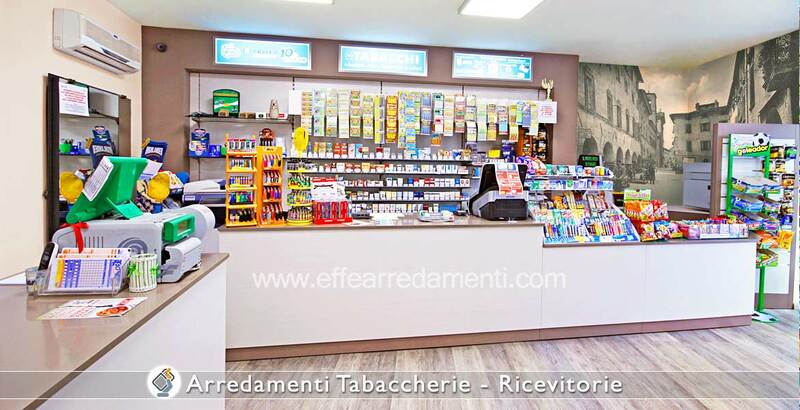 To notice the intuitive classification of the sales counters: on the right the receivers, on the left the tobacconist. Check out the other photos on this realization! Photo n. 007 - In photography, Effe Arredamenti has created this cash desk for tobacconist's and receivers with glass backsplashes. In the background walls equipped with wooden shelves and dividers for displaying cigarette packs. To note the nice chandeliers. Photo n. 008 - In this photographic point of view, the retro cash desk for tobacconists and receivers with sisal terminal stations, enriched as you can see shelves, open compartments and drawers, all to make your experience as retailers as simple, organized, convenient and practical as possible. 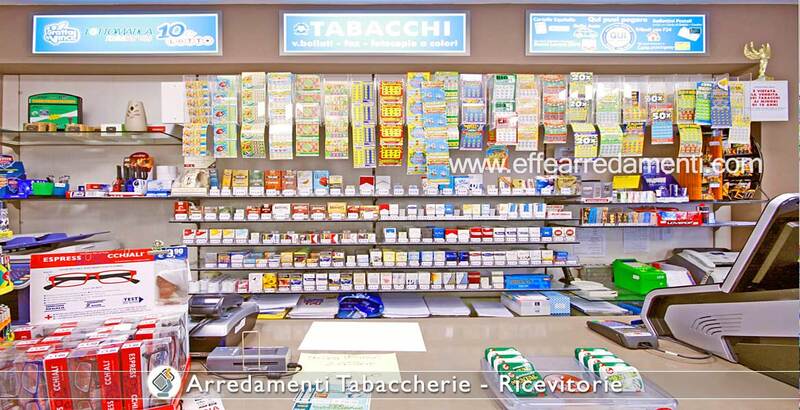 Photo n. 010 - In this photograph: allestimento tabaccheria, ricevitoria and cartoleria built in Ravenna, the space is divided into two areas, one reserved for the sale of products tabaccheria and ricevitoria, the other reserved for Stationery shop. 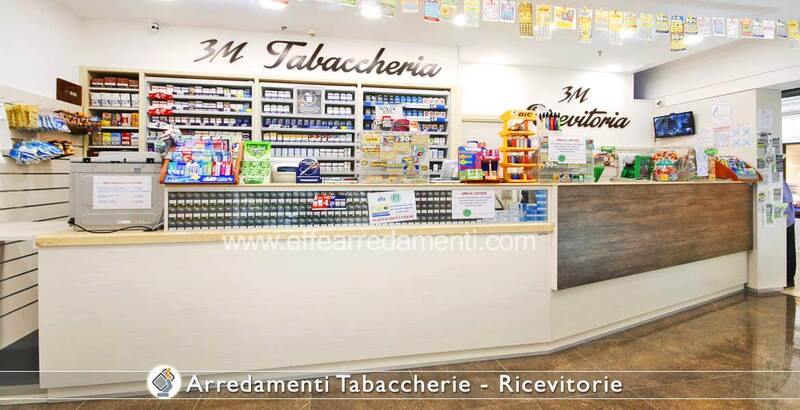 Photo n. 040 - Overall look on this beautiful tobacconist's and receivers' shop in Sicily in Catania. On the left the cash desk with glass backsplashes, showcases, various display elements. In the background, sisal station for the players. On the right, illuminated windows for your most precious items. Photo n. 050 - As you can see in this photo, we wanted to show you the furniture and the retro counter tobacco shop, made up of cigarette displays, drawers, furniture with doors, display cabinets, panels with aluminum slats (ie the ducts where to insert the hooks for shelves and blistered ). 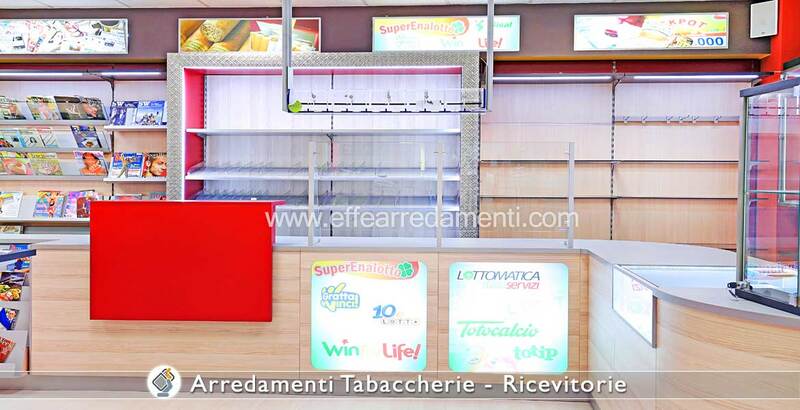 Photo n. 060 - Effe Arredamenti has created this piece of furniture complete with chairs, bench and tables for snack bar e tobacconist's. 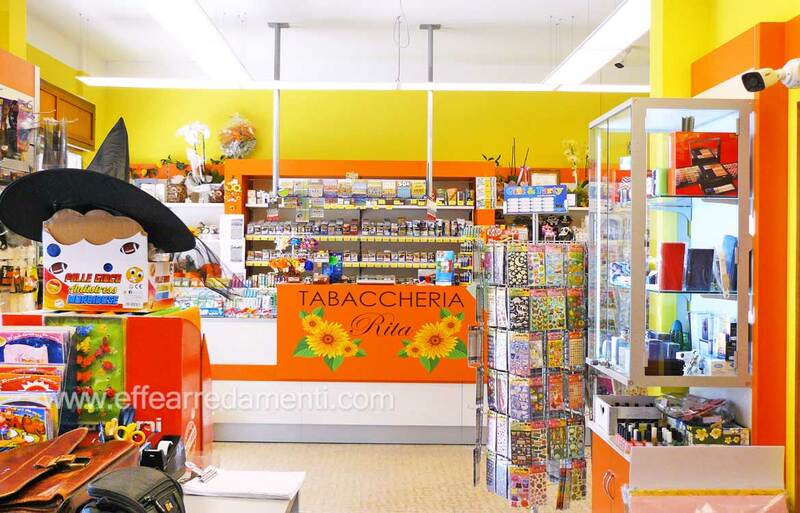 Note the bright and attractive colors of the chairs, the lighting that goes down from the ceiling (chandeliers and light points), the semicircular bench for the display of food products, in the background the tobacconist's desk. Photo n. 070 - Effe Arredamenti has created this magnificent display counter for this tobacconist and bookshop, characterized by the large lower illuminated display cases, a superior scratch and winery display to make the most of the space, back-counter with cigarette display modules both in classic packages and loose-cut tobacco in envelopes, while at the bottom and at the top have been placed furniture containers with sliding doors for stocks. 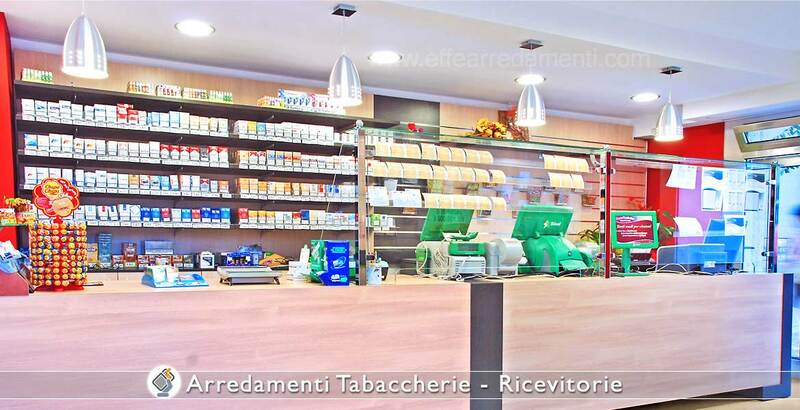 Photo n. 073 - Effe Arredamenti has created thecomplete furniture for this tobacconist, newsagent, reception and snack bar. Four shops in one, for different needs. 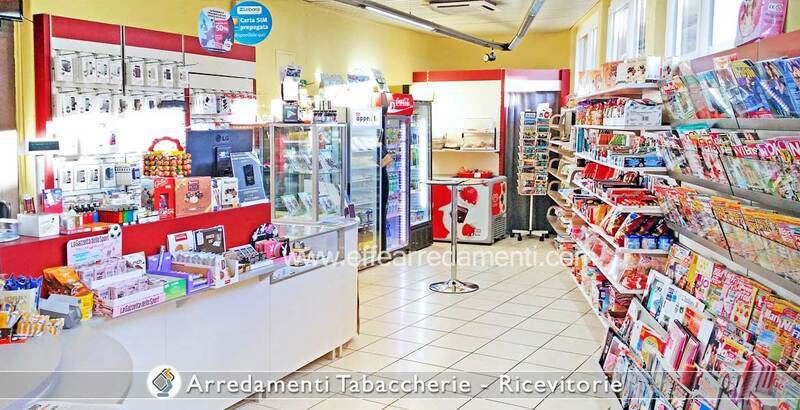 On the right the newsstand department, with an exhibition of newspapers and magazines, then the snack bar to calm the appetite, on the left the tobacconist and the receivers. We have made maximum use of a very large space, to group four different types of stores. Photo n. 075 - Photography is taken from our show room, which you are invited to visit. Here it is shown the standard furnishings of a newsagent, tobacconists and various smoking items, receivers. Of course, the furniture required by you will follow your needs and those of the room in which you want to set up the business. To note the glass uprights of the section of the ticket office and the aerial arrangement of scratch cards, excellent for this section. The bright colors satisfy the sense of sight and invite to purchase. Photo n. 080 - In the foreground the section of the ticket office with the now classic air-conditioning of scratch cards. In the background, exhibition walls equipped for the most diverse types of goods, starting from newspapers and cigarettes. Photo n. 090 - Receiving and tobacconist section. 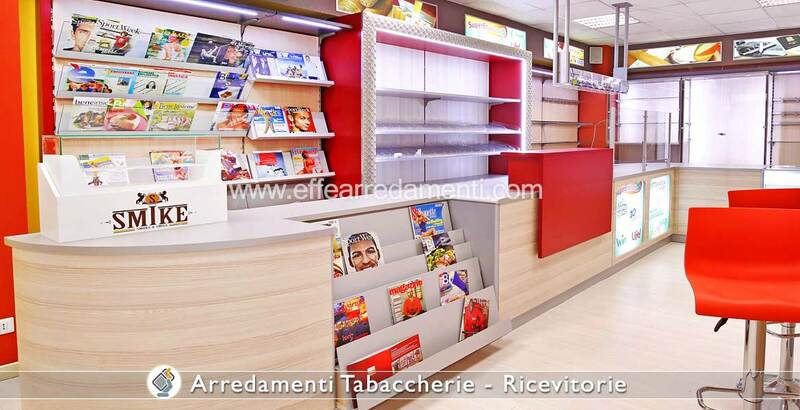 Effe Arredamenti has created this tobacconist and reception counter with glass backsplashes. Note the light points and the lamps located just above the desk. 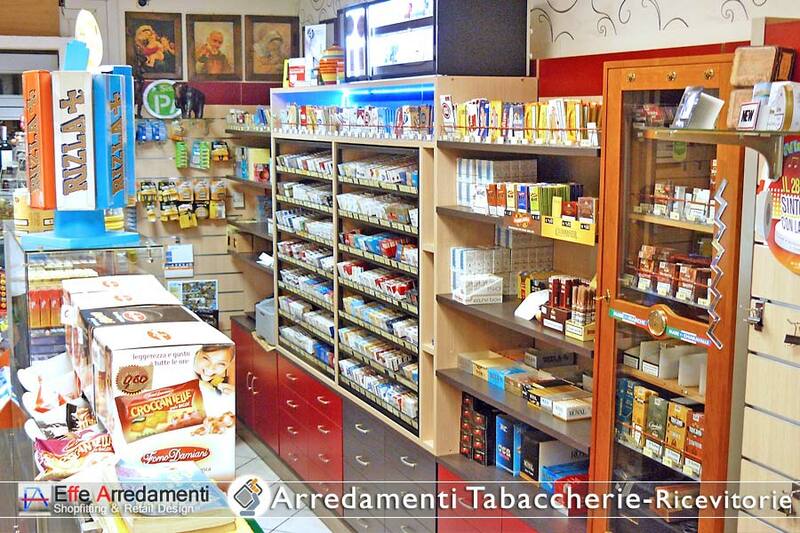 Photo n. 095 - Equipped display walls with specific accessories for tobacconists and receivers. In this photograph you can admire a long counter with glass backsplashes. On the left the section dedicated to scratch cards. At the center the tobacconist section. On the right, the magazines and newspapers section. Photo n. 100 - Beyond the cash desk with goods on display, modular wall equipped for the specific display of cigarettes and scratch cards. The scratch card show returns to be over cigarettes. Photo n. 110 - On the left the cash desk; at the center the stations for the receivers and for the compilation of the coupons. Photo n. 120 - Cash desk with beveled corner wall to make the most of the space. 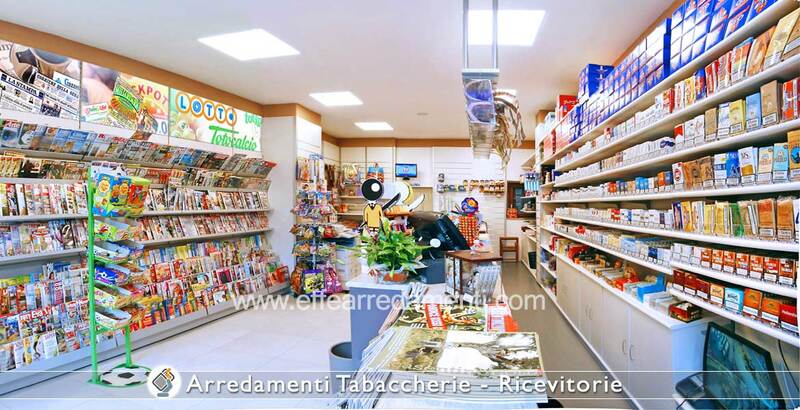 Here all the articles for tobacconists are displayed: tobaccos, loose tobacco, maps, lighters and smoking accessories.